According to the latest annual Global Salary Survey from specialist professional recruitment firm Robert Walters, jobseekers in the Philippines will have access to a wide range of career opportunities as companies ramp up their recruitment activities in 2017. To address talent shortages for certain job functions, employers will focus on attracting both domestic and overseas Filipino professionals with the relevant work experience, strong communication skills and commercial acumen. Market insights from the recent annual Global Salary Survey suggest that qualified professionals moving jobs in 2017 can expect average salary increments of 20-30%. Professionals with sound experience in strategic business development, financial planning and treasury will be highly sought after by employers in the accounting & finance sector. The banking & financial services sector will be hiring actively due to the growth in complex and critical functions such as investment banking and compliance roles. As companies strengthen their corporate structures and HR frameworks, there will be a demand for talent acquisition and recruitment experts, and change management HR practitioners. 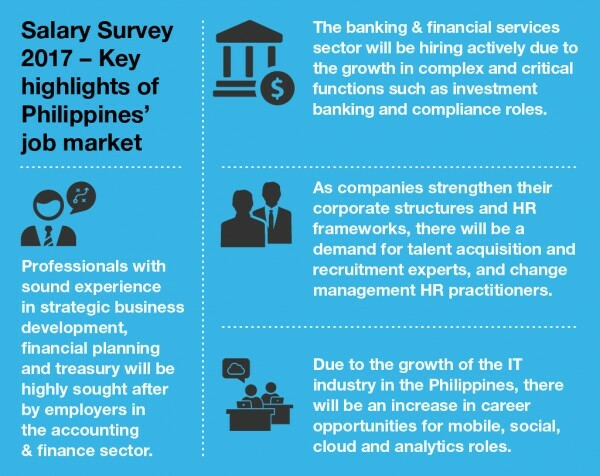 Due to the growth of the IT industry in the Philippines, there will be an increase in career opportunities for mobile, social, cloud and analytics roles. Robert Walters’ Salary Survey is based on an analysis of placements made across its network of offices and specialist disciplines during the course of 2016. Now in its 18th year, the Survey is used by employers, HR managers and employees for benchmarking salary levels within their industry.